My name is Aaron Bertelsen, this is my third year of growing vegetables at Great Dixter, any advice you can give, I will be happy to receive. 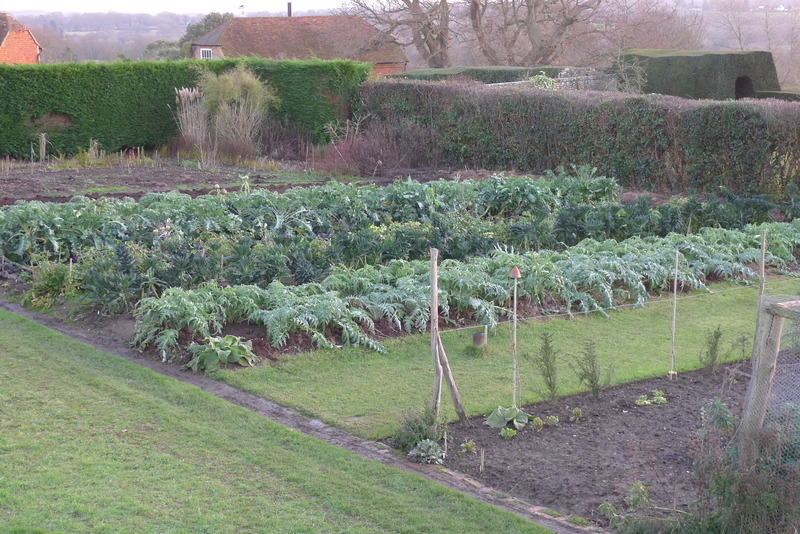 This blog will keep you up to date with what is happening in the vegetable garden. I really love the work, part of this is because of the feedback the public give, often it is men from the North who have grown vegetables for a very long time and can be a great help with crop problems. I grow a lot of the vegetables that Christopher grew because they like our soil, we are on a heavy clay that has had compost added to it for the past one hundred years, you could not get better soil year round. I grew up on the West Coast of Auckland (New Zealand), we had one of those lifestyle blocks of land, there really is not a lot you can do with the land but play on it, my Grandfather used an acre of the land to grow vegetables and sell them to local families, his style was function over form as is mine now, as a child I enjoyed spending time with him, not sure I was a lot of use but I loved to eat what he grew and seeing what he was up to, I was also known to do things such as turn sprinklers on when he was near them etc. I would just like to add that there are going to be both spelling and grammar mistakes on this blog, the point of this blog is a moment of time after a days work, letting you as the reader know what I did in the garden that day or the morning after, I will not use my time going over what I wrote, it is a blog after all. Aaron not for publication, but I and I am sure others would enjoy knowing about the garden as a whole, an over view, its size and such. A grand picture every now and then tells a story too. Thanks for the blog I look at it all the time. I’m one of your followers – The Geeky Gardener (www.thegeekygardener.com) – and I’ve been so impressed with your blog that I’ve just nominated you for a Versatile Blogger Award. Congratulations. It’s an award that bloggers give to other bloggers. Aaron I enjoy reading and seeing your photographs. When is the book out on shelves? Maybe next autumn, will know more at the end of the week. I wanted to take some time to thank you for the inspiration you’ve given me with your work. I recently started to practice sustainable gardening before I left for Boston and your website and blog post have helped and inspired me tremendously. I’m currently working on a project at work that requires us to make a website & blog for a business idea we may potentially have. My main idea is for a business that builds vegetable gardens to encourage organic and sustainable gardening in Sydney, Australia. I’d like to write a questionnaire blog post about you and ask some questions as to how you got into gardening and questions of a similar nature. All I’d ask in return is for you to share a link on a blog post to direct your followers and any viewers to the article about you on my blog and website. If you’re interested, let me know and I’d love to publish your article to promote the sustainable living movement and your blog. Thanks for your interest, my time is very tight this year, sorry. Pingback: He is a gardener and cook at a 14th century house in southern England. I would like to personally congratulate you as your blog Great Dixter Vegetable Garden has been selected by our panelist as one of the Top 75 Vegetable Gardening Blogs on the web. That is very nice, thank you.